Today it is very difficult to imagine the history of blackjack without the name of Ken Uston. This fascinating man and his counting team are the ones who used card counting system professionally for making big money out of blackjack. Ken Uston was not only a professional blackjack player. He was also a wonderful writer who left us a series of books about blackjack, video games and computers. He was a man for whom blackjack was not just a card game but also a way of life and business. But everything was not so wonderful before. There was a moment when Ken Uston was suspected to be a blackjack cheater for his electronic card counting device. 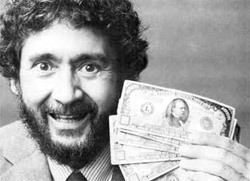 He and his blackjack team represented five pocket-sized devices in 1977. These devices helped them to win a great amount of money (over $100 000) for a very short period of time. Well, it was their plan actually, but it happened to be so, that one of those devices was revealed and Ken Uston pleaded guilty but was soon bailed. This person is also known as a master of disguise and the one who tried to be at law with casinos because of their decision to bar skilled players and consider them to be cheaters. Uston himself was barred from many casinos and that is why he had to wear different suits and change his appearance somehow in order to have a chance to continue playing his favourive card game – blackjack. Anyway, the court of New Jersey resolved that Atlantic City casinos did not have a right to bar skilled blackjack players; so, Ken Uston had become to be non-guilty again. Ken Uston is a member of the Blackjack Hall of Fame. This organization honors the greatest blackjack experts, professional players, authors and all other people who had an influence on the card game of blackjack. He was honored to become the member of the Hall in 2002 posthumously (Uston was found dead in his apartment in 1987 (the 19th of September). The official version of death was heart failure. Ken Uston is listed at the Blackjack Hall of Fame as a person who popularized the team play, won the case against Atlantic City casinos and wrote the great books on the topic of blackjack.